You may uploaded these data to your gps device to find the precise location and direction during the Damavand trek. In case of bad weather and poor visibility, it is very useful and it could save your life. Tehran> Camp1 Polour> Camp2 Base> Camp3 New Hut> Damavand Summit. 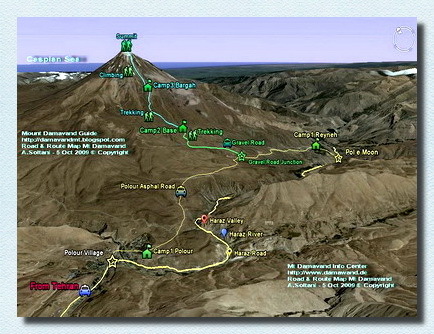 For south route GPS Track in GPX Format refer to Damavand Info Download Page. All Rights Reserved. © 2012 Mt Damavand Info Centre (Forums Damavand). All the material on our websites, weblogs and Forums are protected by copyright. No part of the site may be published, reproduced, stored or transmitted in any form without prior written permission. You may use the GPS Tracks for personal use only. Current time: 26-04-2019, 08:21 AM Powered By MyBB, © 2002-2019 MyBB Group. Theme created by Justin S.